A PRIEST attempted yesterday to reach out to men of violence who continue to “crucify” the families of their victims. Southill parish priest Fr Pat Hogan referred to people in Limerick who harboured “deadly secrets” about crimes such as murders and abductions, especially missing people. He was speaking at the funeral mass of an innocent victim, Jeffrey Hannan. 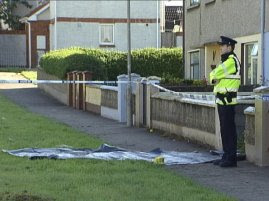 The 19-year-old was beaten to death early on Thursday last. Fr Hogan said Mr Hannan, described locally as a fine young man, was the fourth person to die violently in the Southill parish within the past 12 months. “There are many at this side of Limerick city and across the city who carry deadly secrets,” the priest said. “Secrets of those who have killed, carried out such acts of violence that resulted in Jeffrey’s death. Others are missing, never found — such as Richard ‘Happy’ Kelly and Matthew Carroll. There are people who know what happened to them. There is forgiveness for all, even those with such secrets,” said Fr Hogan. Fr Hogan also hit out at the way some sections of the media reported Jeffrey Hannan’s murder claiming he “was known to gardaí”. Fr Hogan said such violence as that which has claimed the lives of Jeffrey Hannan, Thomas Moran, Noel Crawford, and Pat Coleman in the past 12 months involved innocent people who were set upon.